We are currently working on the European Added Value project, in a European alliance with organizations in Poland, Ireland and the Netherlands, with the common goal of creating innovative changes in the teaching of mathematics in primary school. For this project, we have created a focus group of teachers and experts who have experience with the teaching of mathematics. The group consists of both public and private primary school teachers that have a variety of pedagogical styles, from more traditional approaches to more alternative ones, such as the Waldorf and Montessori schools. The first problem that we encountered with teaching mathematics was to further understand the concept, as it continues to be an abstract subject that largely generates frustration and difficulties among many students. To solve this issue, all of our focus group has agreed that using visual and manipulative materials is crucial, as opposed to more abstract learning (such as purely written formulas). In Catalonia, we highlight the contribution of Anton Aubanell and Maria Antonia Canals, with an extensive collection of manipulative materials. On the other hand, we have also found tools such as GeoGebra, which is an innovative digital resource that opens up an infinite world of possibilities to facilitate an understanding of fast and visual mathematics. The second problem that we often encounter for teaching maths is the difficulty for many teachers in relating the subject to other areas of life. Often, maths is only explained by using maths. But this can also be solved: more and more, we observe an increasing tendency to relate maths to other disciplines, such as history, music, movement, cooking, language, art and life. In this transdisciplinary line, we highlight the enormous informative task of Claudi Alsina, who has been a part of our focus group and who surprises us with books like Mates chef. A sofrito of numbers and forms for chefs and gourmets and Geometry for Tourists. A guide to enjoy 125 world wonders and discover many more, among the hundred publications you have written about mathematics. The last problem is perhaps the one that poses the largest challenge: to give the teaching of mathematics a sense of face to the students; that is, show its usefulness for everyday life. In fact, 50% of the teachers we interviewed told us that, despite using visual and manipulative methodologies, stories or games, the most repeated question by the students continues to be: “Why do we have to study this?” That is why we emphasize the importance of working with real life situations and problems of daily life, which help bring the subject closer to the students. 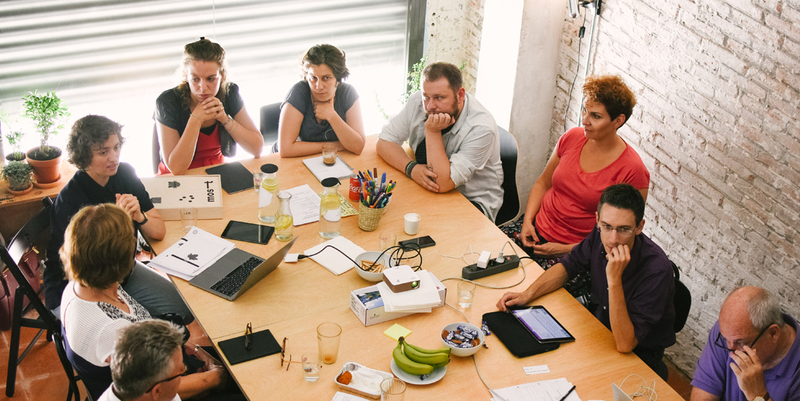 This past June, we hosted in Barcelona our three partner organizations for this project, to get to know each other better and to continue collaborating. We shared the research that each party had developed in their respective country, finding common aspects such as the need to use manipulative and visual materials, that is both challenging for the students and is easily connected to everyday life. Likewise, we started the conceptualization work of the tool kit that will be developed at the end of the project. With this international meeting, we have officially opened the new Smilemundo headquarters, located in the heart of the Barcelona neighborhood of Poble Sec, as we warmly hosted the fourteen participants from Ireland, Holland and Poland for the week.